The India Meteorological Department and private weather forecaster Skymet are diverging on July rainfall, after having differed over this year’s monsoon prediction. Both agree there will be a let-up in rain around the first week of July as the Madden-Julian Oscillation and the Indian Ocean Dipole, factors that help the monsoon, weaken from the first week of July. Skymet, however, feels this lean phase will be broken by development of weather systems in the Bay of Bengal, pushing rain clouds in eastern India, Odisha, Telangana, Chhattisgarh, Madhya Pradesh, Maharashtra and the west coast. The IMD on its part is sticking to its forecast of July rainfall being 92 per cent of the long-period average, a below normal prediction with a model error of 9 per cent. “There is no cause for us to revise our July forecast and we see a dry spell at least in the early part of next month,” DS Pai, director of the long range forecast in the IMD, told Business Standard. He said the Madden-Julian Oscillation had peaked and would weaken in the first week of July as the Indian Ocean Diapole continued to remain neutral. “The Madden-Julian Oscillation was primarily responsible for the monsoon making a better than expected start in June,” Pai said. He said it was early to forecast development of systems in the Bay of Bengal and if there were any changes these would be captured in regular weekly and fortnightly forecasts. The IMD is expected to update its monsoon forecast by the end of July. The monsoon entered India after a delay of almost five days but made steady progress since then. It is poised to cover the entire country by the end of June. AccuWeather.com too predicted that monsoon might lessen from July onwards and drier weather will take hold, heightening fears of a drought. “The pulse that helped activate the monsoon will move into the western Pacific Ocean, leading to a quieter phase of the monsoon by this weekend. "This quiet phase will carry into at least the middle of July as the effects from El Niño take hold,” AccuWeather Senior Meteorologist Jason Nicholls quoted on its website. 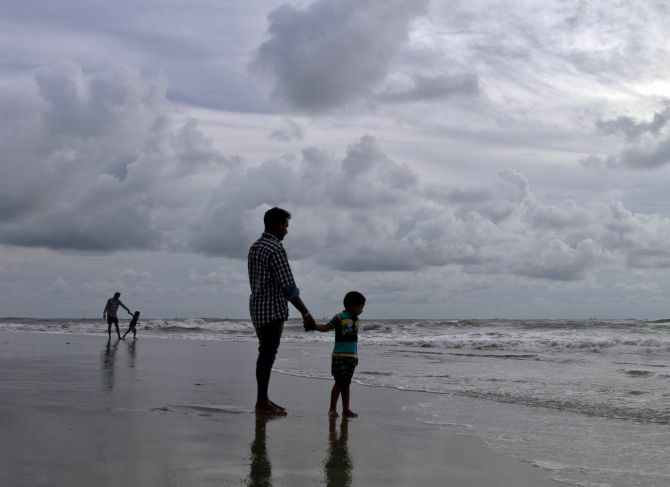 Mahesh Palawat, chief meteorologist of Skymet, however, said that though there will be a break in showers between July 3 and July 6 and the monsoon will be confined to the foothills of the Himalayas, but thereafter a new system is expected to develop over the Bay of Bengal that will cause widespread rain in Odisha, Telangana, Chhattisgarh, Madhya Pradesh and Maharashtra. “This system will sustain till July 23 and the west coast will remain active during this time. Then there is a break of two or three days and showers will resume from July 23,” he added. "The southwest monsoon is expected to end June with a surplus of 10-15 per cent," Palawat added. He said July rainfall would be more or less normal, with some breaks, but showers in peninsular India would be weaker than in the other parts. Till June 23, rainfall was almost 23 per cent more than normal. Skymet had predicted June rainfall at 107 per cent of the long-period average. The average rainfall for June is 164 mm. Experts feel that rains in July and August will determine the kharif harvest because these two months typically receive the most rain during the season. India receives about 289 mm of monsoon rainfall in July and 261 mm in August . The Australian Weather Bureau’s latest forecast said El Niño, a global weather phenomenon that upsets the monsoon, continued to strengthen but the Indian Ocean Diapole was neutral and the majority of the models suggested it would remain so. 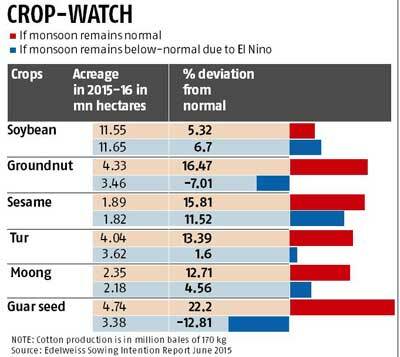 A report by Edelweiss said if the monsoon was normal production of pulses, soybean, maize and groundnut could be robust. These crops fetched good prices last year and farmers might devote higher acreage to them. If rainfall in below normal, Edelweiss reckons most of the damage will be to the paddy, maize, groundnut, guar, castor, tur, moong and bajra crops. The area under cotton, sugar and urad will remain high, it estimates. (see chart).